Update at 2010-01-08T20:40Z: It looks like the takebackthe20.com web site has been completely removed now, so the links to it below won’t work. Earlier today US congresswoman Gabrielle Giffords (Democrat, Arizona) was shot in the head at a public meeting. A number of other people were injured, and at least one person is reported to have died. At the time of writing, early reports that Ms Giffords was killed have been corrected, and she is reported by the BBC to be undergoing surgery. The only reason I am commenting on this tragic event is that, as with other matters I have recently commented on, it looks as if somebody is doing a poor job of covering their tracks online. 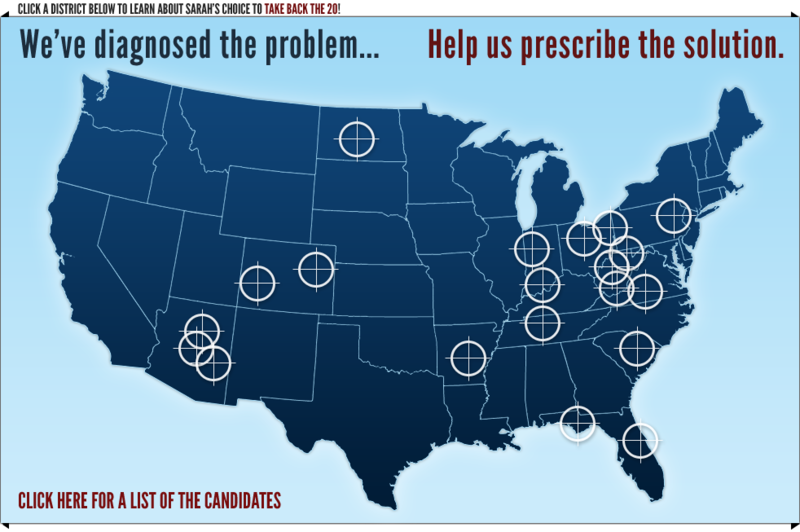 A web site at the domain takebackthe20.com recently published a graphic showing a number of states, including Arizona, adorned with gunsights. In fact, Arizona has no less than three of them. This graphic has suddenly disappeared from the site… well, so it seems at first glance. A look at the whois record for that domain (reproduced below) shows that it is owned by “Sarah PAC” which is Sarah Palin’s Political Action Committee. The map with the gunsights also has the words “Click a district below to learn about Sarah’s choice to take back the 20!” displayed at the top. Of course there is no evidence that the person who committed this appalling act of violence was inspired to do so by Sarah Palin’s PAC’s web site; but the fact that the PAC have moved so fast to remove the potentially embarrassing material that could be interpreted as inciting violence suggests that they realise how the material might be construed. Of course, there is also no reason to suppose that Ms Palin’s PAC endorses or encourages violence in any way, but those who regard guns as totems of freedom rather than potentially lethal weapons seem inevitably to fall into the regrettable tendency to use them to symbolise political aspirations in a way that the more literal-minded of their supporters might fail to understand as metaphor.